Melbourne is a great city for sports, art and culture. One of the places where these things come together is Federation Square. Federation Square is Melbourne’s central public square. In many ways, it is the real centre of Melbourne. But it is much more than just a square. 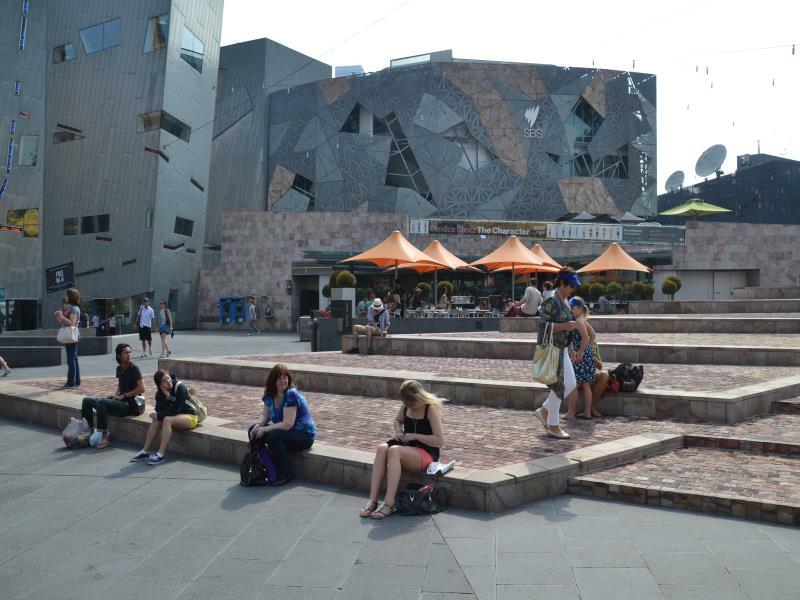 Like every city square, Federation Square has large open spaces where people can gather. It has an open air theatre which holds more than 15,000 people. It has large television screens so people can watch major television events such as the Olympics. But as well as outdoor spaces, Federation Square has many excellent indoor areas and spaces. It has many cafes and restaurants where people can meet and enjoy a meal, or a snack, along with some of Melbourne’s famous coffee. Federation Square also has art galleries, museums, exhibitions, studios, cinemas, a theatre and many shops. And most of all, Federation Square is a place where things happen. Musicians perform their work, artists show their paintings, their drawings or their sculptures, conferences are held, television programs are made, festivals are held and book and wine fairs are held. One special museum is the Australian Centre for the Moving Image. This museum explores film, television and digital culture. It holds exhibitions and screenings, and educates all visitors about the important role of film, television and computer imaging in modern society. Another important gallery at Federation Square is the The Ian Potter Centre. This art gallery is part of the National Gallery of Victoria and is Australia’s first major art gallery for Australian art. You can even rent a bicycle at Federation Square so that you can cheaply explore the city of Melbourne. Or you can take part in one of the many activities. Regular concerts at Federation Square include rock, classical, pop, hip hop, folk and R n B music. Federation Square was opened in 2002 and it now has over 10 million visitors each year. It is built over a working railway yard right next to Flinders Street station, one of Melbourne’s major city railway stations. The buildings and open spaces at Federation Square rest on a huge concrete deck built over the railway yard. In spite of that, the design of the deck means no noise or vibration from the railway disturbs the space or the buildings in Federation Square. Federation Square has become one of the most important meeting places in Melbourne. People call it ‘Fed Square’. When our 2012 Olympic team came home, Melbourne welcomed them at Federation Square. The main tourist information centre for Melbourne is also here. There is no doubt that Melbourne would not be the same without Federation Square. When you come to Melbourne, make sure you visit Fed Square. For more information, go to www.fedsquare.com/. Podcast 8 Quiz - Did you understand the podcast? True or False? The open air theatre in Federation Square can hold more than 15,000 people. True or False? – People gather in Federation Square to watch the Olympics on the large screen televisions. True or False? – You can buy some of Melbourne’s famous coffee at Federation Square. True or False? – You can see artist’s work and hear music at Federation Square. True or False? – The Australian Centre for the Moving Image is a popular history museum at Federation Square. True or False? – The Ian Potter Art Gallery shows art from Australia. True or False? – Federation Square is built over the top of a working railway yard. True or False? – The people of Melbourne call Federation Square ‘Fed Square’. True or False? 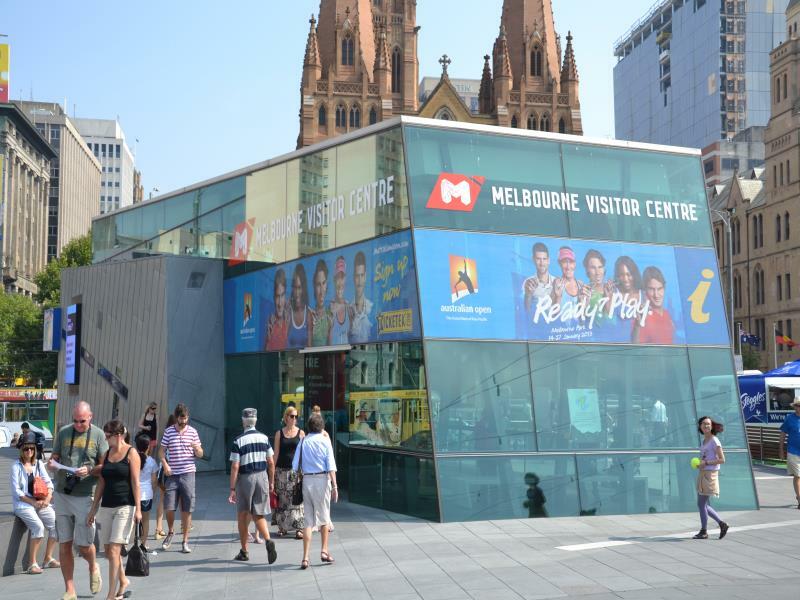 – A good place to find the Tourist Information Centre in Melbourne is at Federation Square. True or False? – Rob doesn’t like to visit Federation Square. festivals = when people come together to see organised music, art and other activities. Many thanks for your comment. I appreciate your feedback. I am interested in what you mean when you say that ‘it only shows part of it’. Perhaps you could write me an email at rob@slowenglish.info and give me some more detail about what you mean by that. Then I could answer your query. ok thanks for your reply. i’ll send the details to your email address attached.
? listened 8 podcast but didn’t find quiz. Please help me. ? think you dont remove quiz. Thanks for your message. Actually there are a few of my podcasts which don’t yet have a quiz, including number 8. My apologies for that. I plan to add a quiz to these podcasts in the near future. first thank you man then hey could I know whether is it ok in the english grammar using identical articles(or even words) together like in “the The Ian”?? I know it’s part of the name and all but is there another case? Thanks for your comment and your question. Yes, in English it is possible to have a situation where you have the same word repeated, but I think it is quite rare. Usually, people try to avoid this situation as it sounds a little wierd. Most often, they will write it another way. Even so, sometimes it happens. For example, “The lady I saw, saw something else”. “I had had enough.” “That that actually happens is strange.” No doubt there are many other examples like these. Another situation is where words are spelt the same and sound the same but have different meanings. These are called homonyms. For example, you could say, “That is a glass glass.” (meaning the glass which you are drinking from is made of glass.) “Can the rock rock?” (meaning does the rock move back and forward). As for identical articles, perhaps there are some situations but I can’t actually think of one. Lovely place. It remembers me The Barbican in London but more open. We live in a 200.000 inhabitants town, Jerez, which hasn’t got anything similar. I suppose the finantial investment for building the square was public. In Spain, we have had a bitter discussion about the mega public investments which, now that we are suffering a huge crisis, have to be paid by our taxes. Time to dinner. Thank you for your podcast. You are a good ambassador of your country. Many thanks for your comment. I have not been to the Barbican in London. I missed it when I was in London recently. I think our Federation Square was funded jointly by government and the private sector. That is a very common model here in Australia for building infrastructure, including roads. But I guess in a smaller town, it’s harder to get things like that built.